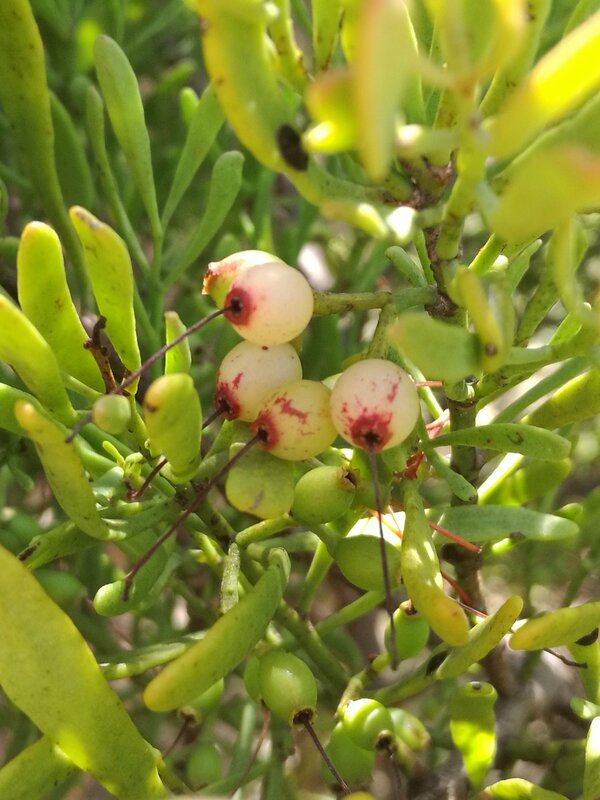 In Australia, Mistletoes are a bushfood because of their delicious berries that tend to be a white or pink/white when ripe. You can eat them green, but white is much, much better. They’re a common and interesting group of plants that are worth a closer look…The berries are full of complex carbohydrates that make them sticky in the mouth, getting stickier the longer you leave them. This leads to the nickname of ‘Snottygobble’ in some areas (not to be confused with this Snottygobble) that I’ve covered before. That slimy stickiness also contributes to Mistleoes’ interesting germination habit that is covered later in this post. Australian Mistletoes are related only by name and general habit to the Mistletoes of European Christmas. We have five species in South Australia alone! The European Mistletoe Viscum album that we’re all familiar with is in the Family Santalaceae while the Australians are Loranthaceae. 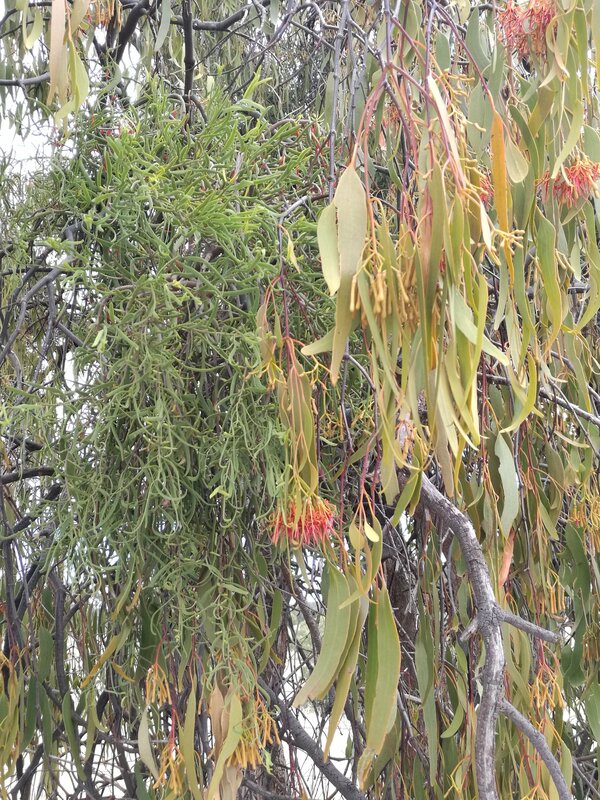 Mistletoes are interesting plants, they are parasites on a variety of trees. They are a ‘hemiparasite’, they are not fully parasitic because they produce their own carbohydrates through photosynthesis. The rest they get from their host plant. In Oz, they are spread by the Mistletoe Bird (Dicaeum hirundinaceum) who’s specialist habits make it perfect for the job. Mistletoebirds eat mostly Mistletoe berries and when they poop them out, they do so with their bottoms aligned along a branch rather than hanging over the side. This results in the seed being deposited on the branch rather than on the ground. The sticky carbohydrates in the seed glue it to the bark then a specialized root called a ‘hypocotyl‘ penetrates the bark. In our area there are two varieties that are found easily. These are Box Mistletoe (Amyema miquelii) and Harlequin Mistletoe (Lysiana exocarpi). These two are have interesting habits. 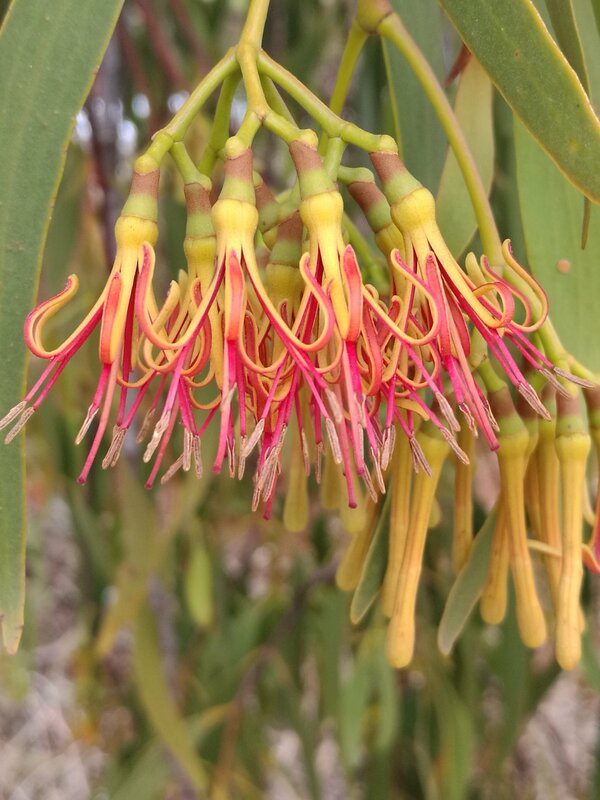 Box Mistletoe only grows on Eucalyptus trees while Harlequin Mistletoe never grows on Eucalypts. 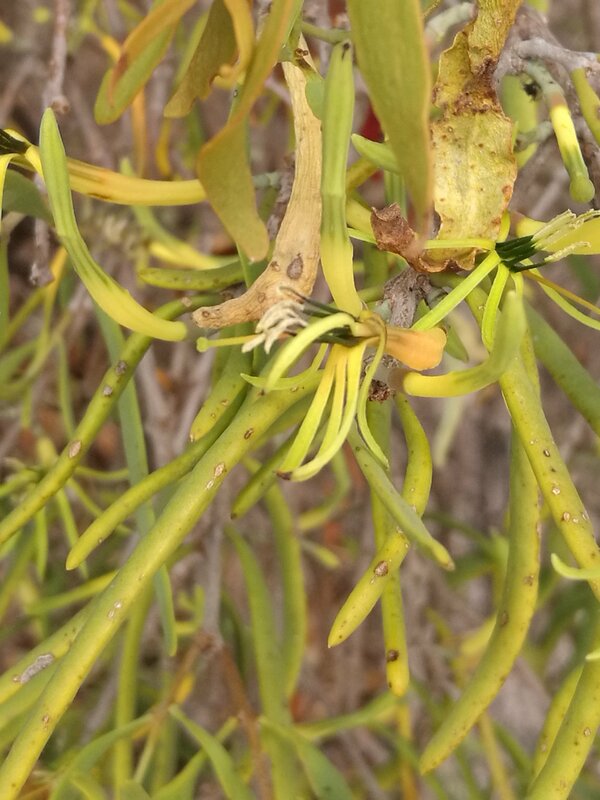 However, Harlequin Mistletoes may be a parasite on another Mistletoe that is already growing on a Eucalyptus! The last picture shows that happening and to confuse the issue and it’s difficult to see because it’s only small, there is a third Mistletoe, a rare Dropping Mistletoe (Amyema pendulum) on the same tree. I didn’t photograph it because I wasn’t aware that it was there until I checked the flower and leaf samples that I took home. 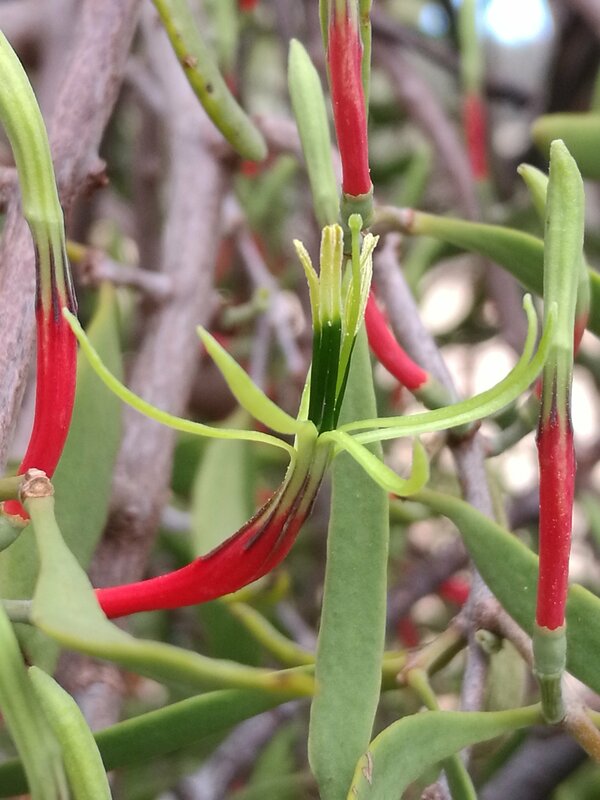 Box Mistletoes have flat, dropping leaves and red flowers in groups of 3 that hang from a group stalk. Each flower has its own stalk and has 5 petals. The flowers hang downwards. They flower and fruit throughout the year. The flowers have 6 petals and are held erect. They flower and fruit throughout the year. There’s 3 Mistletoes in this mix, all on the one tree. For those interested, I mentioned Dropping Mistletoe (Amyema pendulum) earlier. That species is essentially the same as Box Mistletoe except the center flower in each group of three doesn’t have its own stalk. Like I said, Australian Mistletoes are an interesting group…you probably won’t get a kiss, but could get a good feed.